This topic has been weighing on my mind recently as birth photography has gotten more popular and (dare I say?) 'mainstream'. A new crop of people advertising themselves as birth photographers are opening Facebook business pages and offering this service to expecting moms every day. When I began the process of becoming a birth photographer in 2009, I had not seen or heard of anyone in the Hampton Roads, Virginia area offering to photograph births. Now it seems as though it is something many new photographers want to 'break into' - especially if they enjoy photographing maternity, newborn, or families.As an expectant mother, how can you protect yourself and ensure that you are hiring the right person at the right price? 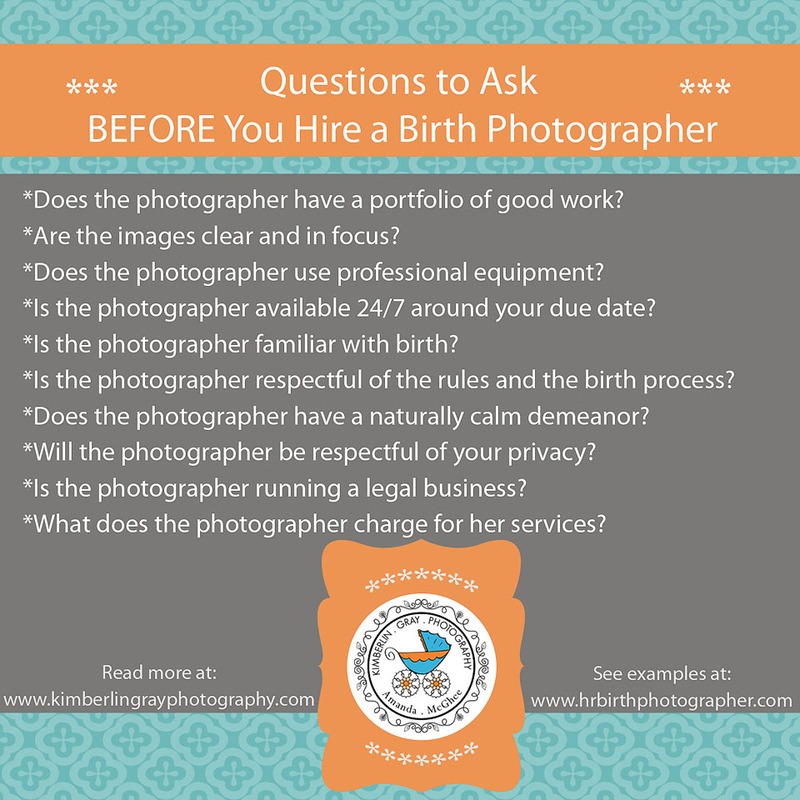 Here are a few questions to ask yourself (and the person you are considering to hire as your birth photographer) and an explanation of each in depth below the photo. Please feel free to PIN this image to your Pinterest board or SHARE this article on Facebook! Does the photographer have a portfolio of good work? Every professional photographer should have a portfolio of work they can share with you. It is important to be sure that the person you invite to capture one of the most important days of your life (and the first moments of your baby’s life!) is a professional who has experience and can produce quality images for you. Ask to see example photos of births she has documented. Your photographer should be able to show you an entire gallery or slideshow of a single birth so that you can see how she captured the process. Are the images clear and in focus? Can you see the detail in each photo? Are the images crisp and clear? If they are too bright (overexposed), too dark (underexposed), or blurry; then the photographer is probably not experienced enough to take on birth photography. Just because she can produce good family photos in daylight does not mean she can produce quality photos in the fast-paced birthing room. A large majority of births occur in low light situations. Night births obviously do not provide much ambient light, and most laboring women prefer to have the lights in the room turned down low during the daytime, as well. Given these conditions, it is critical for a photographer to know how to use the settings on her professional camera to capture clear images. Does the photographer use professional equipment? A basic DSLR camera (or a ‘point-and-shoot’ or an iPhone) will not produce professional quality images. A professional photographer will have the proper equipment to shoot in any situation - home, hospital, birth center, etc. This means having at least two camera bodies (a main camera plus a backup camera in case something happens to the primary camera during the birth), along with multiple lenses, memory cards, and batteries. Most professional birth photographers also have a flash that attaches to the camera - the on-camera flash is *never* used in professional photography. Is the photographer available 24/7 in the weeks surrounding your due date? Birth photography is generally considered ‘event photography’ since it is not a scheduled portrait session with a series of posed images. However, it is very different from wedding photography or other custom photography events, since the exact timing cannot be set-up in advance (with the exception of scheduled cesareans - and even then, mom can go into labor early or unexpectedly before her scheduled date!). Most professional birth photographers are on call, much like an obstetrician or doula, for two weeks before and two weeks after an expected due date. This means that she is available round the clock to be called in for the event and stays throughout the process no matter how many hours it takes. Be sure your photographer understands and is prepared for the ‘on call lifestyle’ - even if it is the middle of the night, on a holiday, etc. Babies come when they choose - you can go into labor at any time and a professional birth photographer has to have a plan in place to attend your birth when she is on call in the weeks surrounding your due date. Is the photographer familiar with birth? Is she respectful of the rules and the process? Birth photography isn’t just about ‘getting the shot’ - it’s about documenting the experience and focusing on the woman who is in labor. It is YOUR birth, not hers. The photographer is a spectator who has been hired to capture an event - she is not there to tell you what to do or tell you all about her experiences. Your birth photographer should never be in the way of the medical personnel or insert herself into conversations about your birth. She should never give medical advice or present herself as an expert on the process. But it is important that a birth photographer is knowledgeable about the process of birth, the stages, and the rules of the birth center or hospital so she knows what to expect and how to be sure she is not impeding in the process. The rule of thumb for birth photographers is to be seen and not heard by everyone in the room. The approach should be more of ‘a fly on the wall’ rather than ‘essential personnel’. Particularly if you are delivering in a hospital, your birth photographer should be professional at all times and be respectful of all rules and regulations. Does the photographer have a naturally calm demeanor and positive energy? This is especially important for women who are planning an unmedicated hospital birth or a home birth. Midwives and doulas all serve to protect a birthing mother’s environment - and any negative energy can impact the birth journey. (Refer back to the ‘seen and not heard’ comment from above!) A professional birth photographer knows to follow a laboring mother’s cues and respect her wishes - spoken or unspoken. Even if your plan is to have an epidural at the hospital, the doctors and nurses should not feel that your birth photographer is anxious, stressed, or overbearing. Also, in the event of an emergency or other complications, the photographer should be able to handle these situations professionally by remaining calm and reserved. Will the photographer be respectful of your privacy? Birth is an intimate and private event. The choice to share your images should ultimately be up to you. Some women choose not to share images from their birth anywhere - either online or in the photographer’s portfolio. Your photographer should allow you to see all images before sharing them on Facebook or a website, and you should have final say as to where or even IF your images are used by the photographer. Some photographers who are just starting out will run special deals for ‘building a portfolio’ - if you take advantage of these deals, know that you are agreeing to allow the photographer to share your images. Sometimes the journey turns out differently than what you imagine or plan. But having the process documented by a professional photographer can be healing when plans go awry. Be sure you discuss these details with your photographer before signing her contract. Is the photographer running a legal business? Speaking of contracts, you should always sign a contract with your birth photographer. A professional photographer will have a business license, pay taxes, and have insurance for their equipment and their business. Why should you care? First, to protect yourself and your birth experience. Hiring a professional photographer ensures that you get what you pay for - your photographer comes to your birth when you call her, and then delivers the images to you within a reasonable timeframe after the birth. There have been stories of photographers who took a client’s money and then went out of business, never to be heard from again. Other stories have told of photographers who took months to deliver images to a client because she was ‘busy‘ and one who went on vacation the week of an expectant mother’s due date and was unavailable at the last minute to attend the birth. You want to be sure that the person you choose to capture your baby’s entrance into the world is a true professional and delivers as promised! Second, we hope that you will want to support a small business that is doing the right thing. Owning a business is not an easy (nor cheap!) undertaking, especially one that takes a photographer away from her family and other clients for hours and hours at a time. Supporting a true professional who is following all business rules and applicable laws is best for everyone! What does the photographer charge for her services? Having a baby costs a lot of money! You may be tempted to choose a birth photographer with ‘cheaper’ prices - but beware! Most of the time, the inexpensive photographers are much less experienced, use inferior quality equipment, and do not provide products that will stand the test of time. Some people may justify going with a less experienced and less expensive photographer by saying that SOME pictures are better than NO pictures. In this case, you may want to consider having a friend or a family member come and take photos for you instead of hiring an inferior or unlicensed photographer. Remember that your birth photographer is on-call for you 24 hours a day, 7 days a week for the four weeks surrounding your due date. She has to maintain a lifestyle that will support leaving her family at the drop of a hat for anywhere from 4 hours to 24 (or more!) hours at a time. This includes missing school events, dance recitals, family dinners, and maybe even holidays like Thanksgiving or Christmas to serve you! It takes thousands of dollars of equipment, hundreds of dollars of licensing and insurance fees, and countless other expenses to run a business. Anyone who does not have those expenses (and does not charge appropriate session/package fees to cover them) is probably not a professional birth photographer and may or may not give you the images you deserve of this important event. Most professional birth photographers also offer payment plans or baby registries, allowing you to spread the cost across several weeks or months rather struggling to make one large payment right before your new baby arrives. While birth photography is a luxury and something not everyone can afford, families that value birth photography will receive the best images and the highest satisfaction by selecting a competent and experienced professional birth photographer. Today is the first of a series I hope to continue called, "Ask Me Anything". I love to teach and sharing a little bit of insight into the world of custom portraiture is very rewarding to me. There are the questions that were submitted. Enjoy! How did you get started in photography? Did you go to school for it or are you self taught? I got started in photography after my daughter was born - like many new(er) photographers, the lure of digital photography was so great when I was wanting to capture those precious moments, but my camera didn’t seem to cooperate. Babies and toddlers are FAST and I was constantly frustrated by only catching the back of her head or missing that flash of smile. Do you use natural light or studio strobes in your home studio? Every shot you see from my studio is completely natural light. I do use a speedlite during overnight, dark births but my portraits are all done either outside or in my home studio (which is a windowed-in sun porch attached to my home). When it comes to simple image editing what do you recommend? For simple image editing of family snapshots, I think iPhoto is very good. You can crop, edit red-eye, change the brightness/contrast, etc. If you are a budding photographer, investing in Photoshop Elements is a must. It is a more basic version of the ‘big’ Photoshop program, but honestly has everything anyone would need to begin learning the program and learn how to edit photos more professionally. If you are a student (or have a student in your home) you can get a student discount on Photoshop (any version!) and it’s a HUGE savings! I’d love a great starter DSL what do you recommend and why? If I could only purchase one lens.... ? If you’ve decided to go for it and are committed to learning more about how to use your camera in manual mode (or aperture priority), the first lens to buy is the 50mm 1.8. It is relatively inexpensive, but will help you to master that camera in no time! Where is the best place to order images on canvas? And why? The best place to order your image as a gallery wrapped canvas is from your professional photographer. Seriously, I’m not just saying that! Canvases have become very popular recently with the Groupon deals. But what most people don’t realize is that when you add a gallery wrap to an image, the company takes 2 inches off EACH SIDE of your picture to wrap around the edges. That means that if there are heads or hands or limbs anywhere near the edge of a photograph, they are going to end up wrapped around the top, bottom, or sides of your canvas. Sometimes, this is not a big deal - sometimes, the picture ends up looking very odd or choppy! There have been very few times where I have not had to adjust an image in my editing software to make it look right on canvas - by adding space or background or even going back to my original shot and cropping the file differently so that it gives the company enough room to wrap the edges. Also, some canvas companies will color correct your image - which means they could add a layer or contrast or sharpening or color to the file before printing it on canvas. Some canvases end up darker than the image looks on the screen because of their printing process or the quality of materials they are using. Printing through your photographer (who took the image and painstakingly edited it) will ensure that it looks on canvas exactly the way it should! ? ?Now, I cannot speak to the quality of all consumer canvas companies. Canvas on Demand often runs Groupon deals which are SUPER cheap. $45 for a 16x20 gallery wrapped canvas is almost obscene. :) If you’ve never had a canvas and want to try them out to see if you like that look, I say try it out with them at that price - you can’t beat it. But if it comes down to a showpiece in your home, trust your photographer. It’s worth the extra cost! Best Tips for photographing the constantly moving toddler?? Do your clients come to you mostly by word of mouth or is it a mix of word-of-mouth and advertising? Have you ever advertised in a local magazine, if so - did it work? Nearly all of my clients have come to me by word of mouth or finding my website on Google. I have not yet paid for advertising. Thankfully, I have clients who are wonderful and pass my name on to others. I’m always amazed at what a small world it is. I was recently showing a sample product to a new client who said, “Hey - I work with that guy!” Plus, Facebook is an amazing resource. When people share my photos on their Wall, 300 of their friends and family members see them instantly! I love that! Do you use any actions or lightroom presets? If so, would you share which ones? I do not use any particular actions or presets on a regular basis. Depending on the ‘mood’ of the photo or the lighting in the photo, I will run an action and adjust it to my tastes. The best set of actions I ever invested in is a set from MCP Actions called “The Quickie Collection”. They include quick actions to warm up, cool down, brighten or sharpen. Just little boosts to help the process. As for newborn portraiture, I have made my own special action including some from the Quickie Collection. But on the whole, I like to process each photo individually. I don’t think there is one ‘right’ action for very photo in a session. Also, when using actions PLEASE learn layers and masking. Texture and actions almost always need to be erased from the skin (especially on babies!!) or you risk having a very odd looking person in your photos. If you don’t know how to use layers or masks in Photoshop, google it or go to youtube and find some tutorials. Most Important Photoshop Lesson Ever! Hope you enjoyed these Q&A's - if you have a question for our next Ask Me Anything post, feel free to send it to me at kimberlin.gray@gmail.com!